Both guinea pig lice and rat mites are common external skin parasites affecting these animals. Lce and mites are not the same. The lice that affect guinea pigs are tiny, wingless, flat insects living in the fur and visible to the human eye. Mites are microscopic spiderlike organisms living in the outer layers of skin. 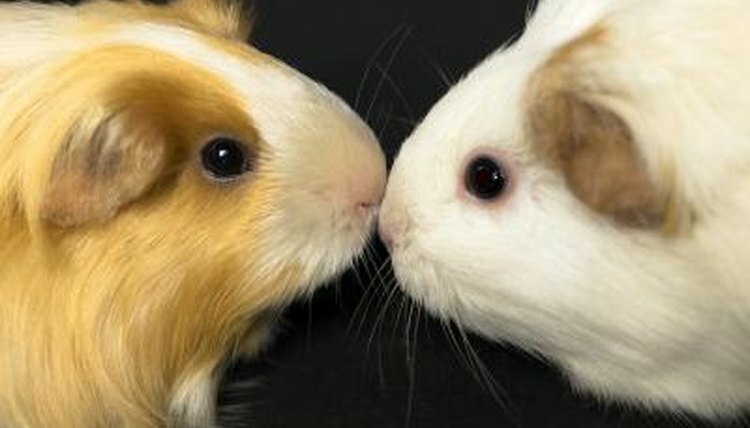 Guinea pig lice infestations and rat mite infestations can cause similar physiological symptoms. Get your vet to diagnose symptoms and recommend treatments. Two different types of guinea pig lice can affect guinea pigs, Gliricola porcelli and Gyropus ovalis. Neither one will parasitize people. Typical areas to find these lice on the guinea pigs include the head, the back of the neck and the shoulders. You can see adult guinea pig lice and their eggs along individual hair shafts. Some guinea pigs don't show symptoms with a light infestation; heavy infestations cause itching, scratching, skin irritation and hair loss. Rat fur mites (Radfordia ensifera) and rat mange mites (Notoedres muris) both affect rats. Since rat mites prefer hairless skin, signs of infestations will first appear as spots or scabs on the tail, ears and nose. The rat mites burrow into a rat's skin and cause intense itching that leads to scab formation. Sometimes, these mites live on rats without producing symptoms. When a rat ages or his immune system becomes otherwise stressed, rat mites multiply and become numerous enough to cause symptoms. Diagnosis of guinea pig lice or rat mites is best left to your veterinarian. Adult guinea pig lice can be visualized on the hair shaft or skin surface. Guinea pig lice eggs, or nits, appear as rows of tiny beads along the hair shaft. Rat mite infestation diagnosis is made by scraping the top layers of skin and microscopically visualizing the rat mites within the skin sample. Your veterinarian may need to scrape several areas of affected skin before finding rat mites. Your veterinarian may prescribe a treatment for guinea pig lice or rat mites. Administering oral or injectable ivermectin for six to eight weeks treats guinea pig lice and rat mites. Sometimes, a Lyme sulfur dip or bird lice spray is suggested as a treatment for guinea pig lice. Prescribed powder insecticides, shampoos or spot-on applications will directly kill guinea pig lice or rat mites on the skin's surface. You must treat all guinea pigs or rats that have come into contact with parasite-infested animals; otherwise your pets will continually become reinfected by each other. Disinfect your animal's cages and all of the cage materials. Disinfection prevents unhatched parasite eggs from reinfesting your animals. Quarantine and examine all newly acquired animals for diseases prior to placing them in with your current animals. Do Chicken Mites Affect Other Animals?